Directions: From MO River Bridge, take a left on E. Main. Go around Capital to E. Capital to property on left. 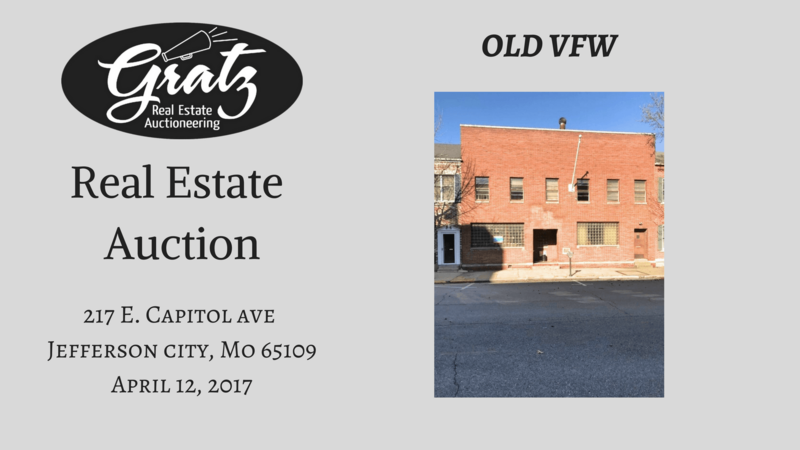 217 E. Capital Ave, former V.F.W. Hall. This building is only 2 blocks from the Capital, offering 4 levels with 7.268 sq ft. There are 21 parking spaces on site. This property would make excellent lobbyist offices within walking distance of the Capital or excellent legal offices within walking distance of the Court House. TERMS and CONDITIONS: 5 (Five) percent of purchase price to be paid into escrow on the day of auction. Cole County Abstract Company will be the escrow agent. Buyer must be preapproved by his lender and have a pre-approval letter from Bank to present to Gratz Real Estate & Auctioneering on day of auction. Buyer must sign a sales contract prepared by legal counsel. Closing will be held within 45 days of auction date. The cost of the title insurance will be split equally between the buyer and seller. Taxes will be pro-rated at closing. Owner agrees to give possession and clear title at closing. Announcements at Auction take precedence over all printed matter. Owner reserves the right to approve the final bid. (For an appointment to view the home prior to auction, call Bill Gratz at 690-0477.) Auctioneer is licensed in Cole County, Missouri.